I am often asked, "what brand of long arm quilting machine do you use for free-motion quilting your quilts?" The answer: I don't have a long arm. I quilt my quilts (and quilts for others) on a home domestic sewing machine. 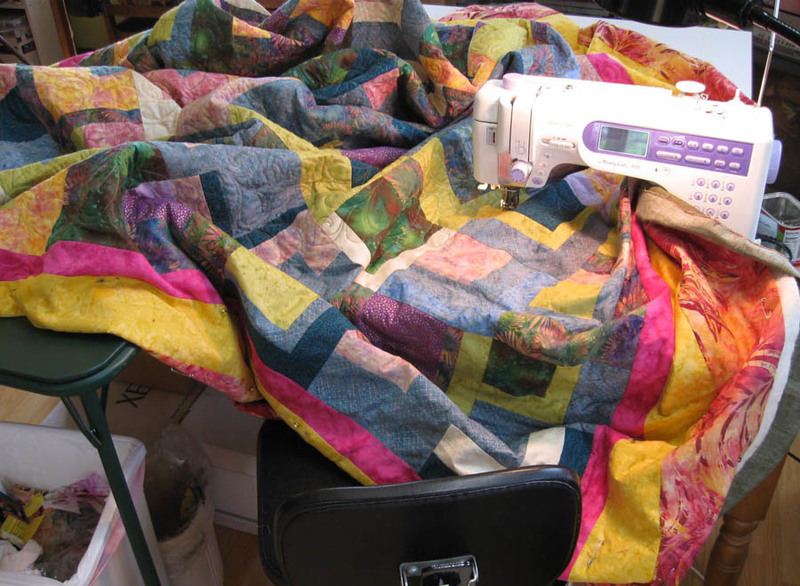 In my Intro to Free-Motion Quilting and Beginning Quilting classes, students also ask, "how do you quilt a large quilt on your sewing machine?" I just completed a king size quilt—a 108" x 120" quilt top—for a customer. I hope the following photos will give you some insight into the answer to these questions. 5 Easy Pieces quilt. King size, 108" x 120". This quilt top was made by a student who took my 5 Easy Pieces quilt class. 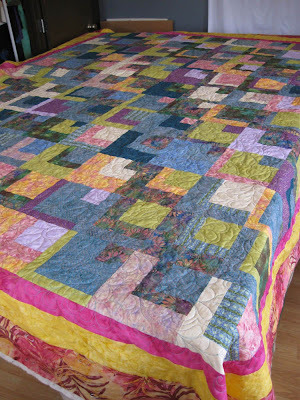 The class project was a 40" x 48" lap quilt, but it can be made any size you want if you just make more blocks. This quilter did. She also added 3 borders. The first crucial step to quilting a large quilt (or any size, for that matter) is careful basting. I pushed two 5-foot banquet tables together against a sewing table that has 2 fold-out extensions. You want as much surface area as possible to tape down the backing fabric. I use masking tape or painters tape to hold down the backing fabric (wrong side up). If the backing is longer than the table or work surface, I tape the excess fabric to the underside of the table. Layer the batting and top on the backing. Smooth out the batting so there are no wrinkles. 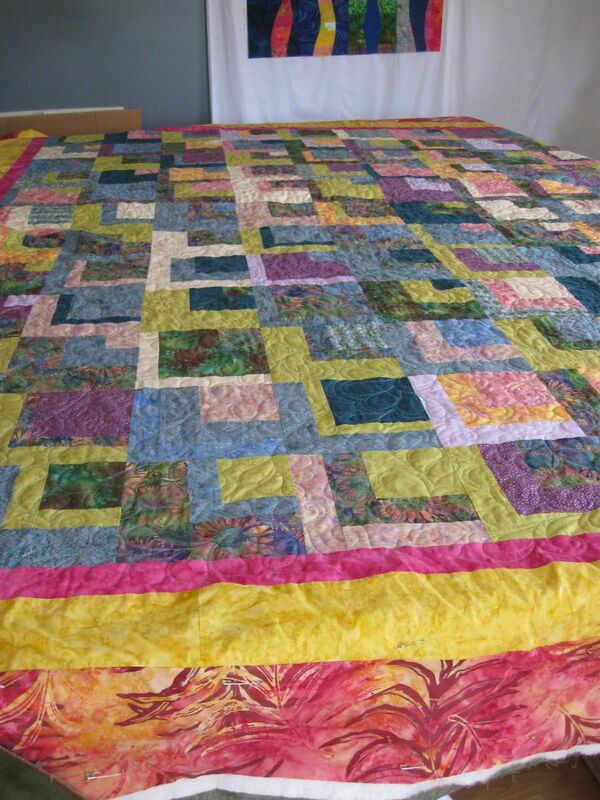 Smooth out the quilt top, keeping borders and any critical areas straight and square. Ease in any fullness. I pin baste with size 1 basting (safety) pins (pins measure about 1-1/8" long). The basting pins are placed about a fist apart, or closer in critical areas such as narrow borders. 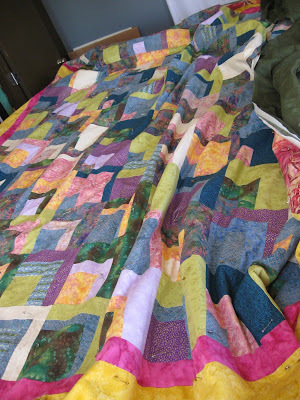 Reposition the quilt sandwich and continue to baste the unabated areas. When one portion of the quilt is basted, remove the masking tape and shift the quilt sandwich so you can baste the remainder. I had to shift from left to right and also top to bottom to completely baste a quilt of this size. After basting, this is a good time to turn the quilt over to make sure there are no tucks or pleats in the backing fabric. 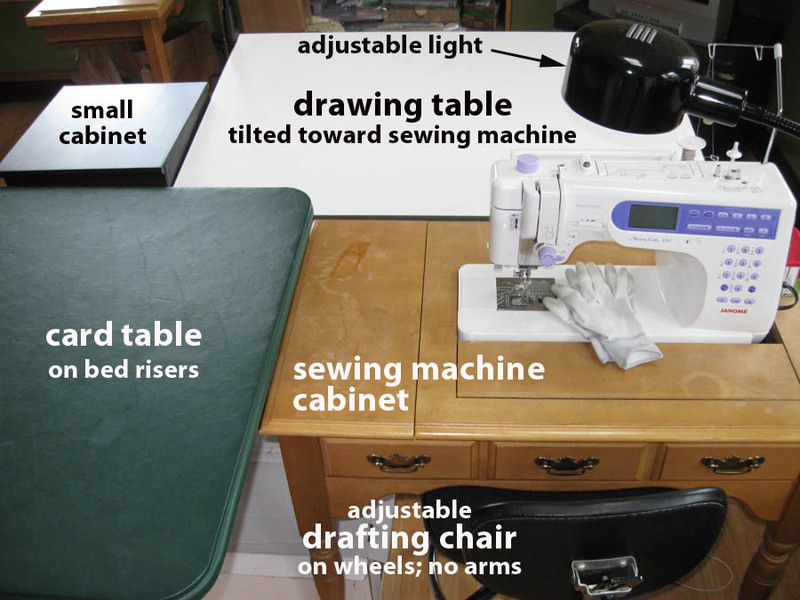 Here is my sewing machine set up. 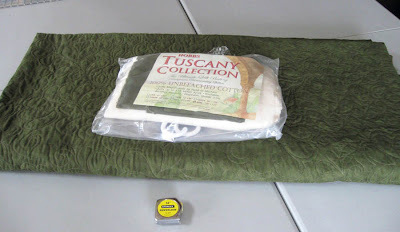 I use a Janome 6500 to quilt my quilts. It's important to have as much contiguous surface area next to your machine on which to hold up the quilt while you quilt. Work space setup for quilting. Below is the same set-up with the quilt sandwich in the machine. When I am sitting at the sewing machine, the quilt is fluffed up around the area that is being stitched. It's like a big "quilt nest." Part of the quilt (if it is big like this one) is up on my chest as I work on it. I have a goose neck light that can be positioned where needed. Work from near the center of the quilt and work outward toward the borders. 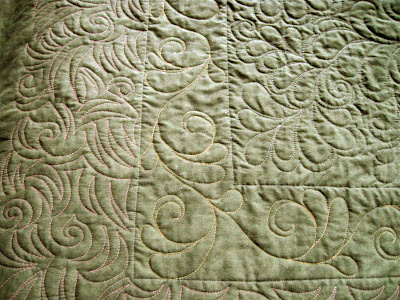 Below shows the center section quilted. Center of the quilt is quilted. The fabric for the backing was a wide back. The quilter chose a mottled solid. 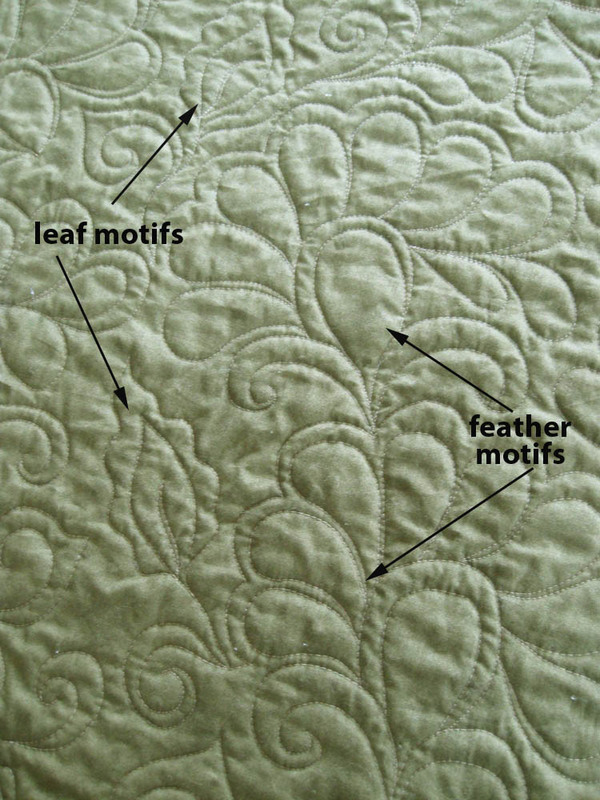 The quilting shows well on solid or reads-as-solid fabrics. 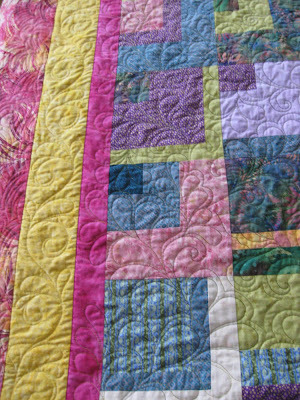 Center section quilted. Back view. 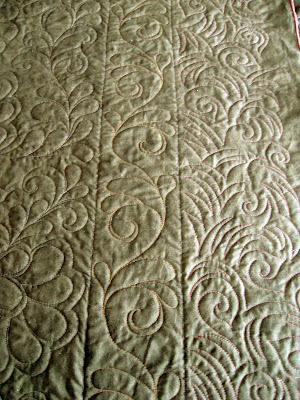 The center was quilted with freeform feather motifs. My friend Margo suggested a scrolling motif for the yellow inner border. Shown below is my interpretation of her idea, flanked by in-the-ditch stitching on both sides. The outside border has another freeform motif. I took a cue for this design from the print in the batik fabric. Center and border quilting designs. Front and back views. 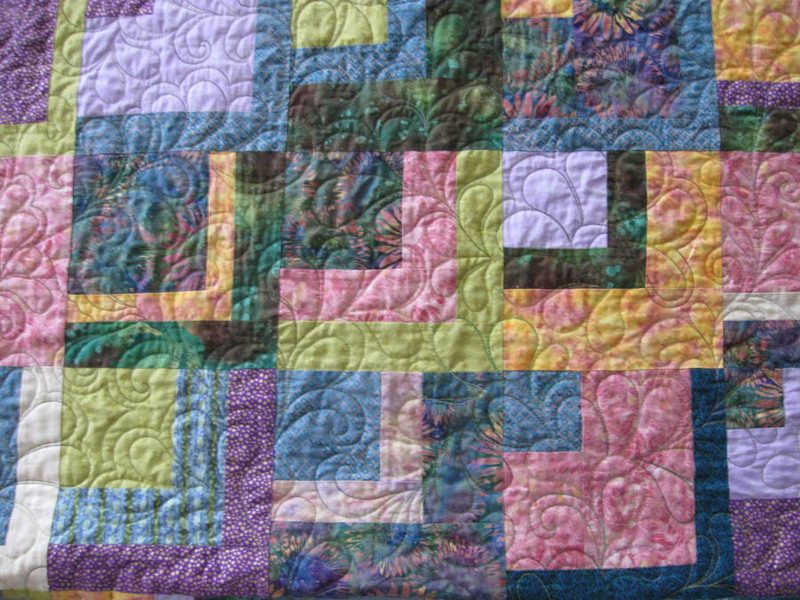 Here are more close-ups of the quilting designs. Center section with 5 Easy Pieces blocks. 10 x 12 layout. Center section with view of 3 borders. 3 color changes for bobbin threads. 12 bobbins used. 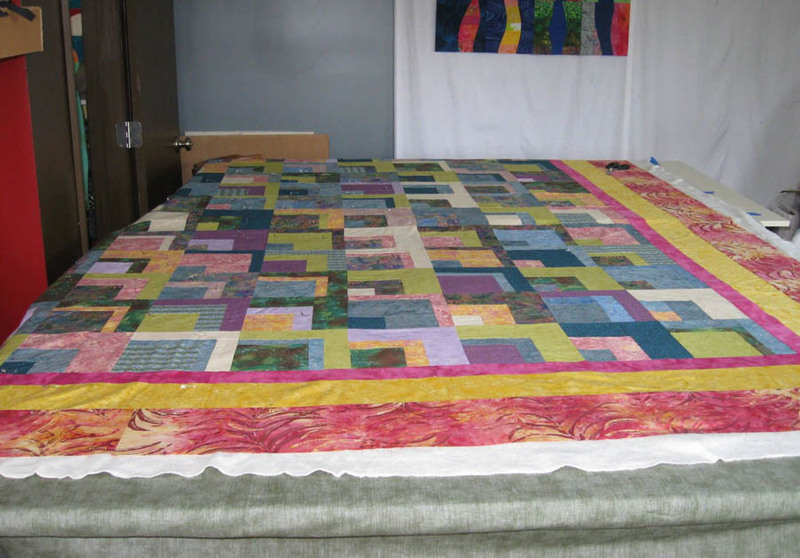 Finished (after quilting) size: 103" x 116". Bobbin color changes. 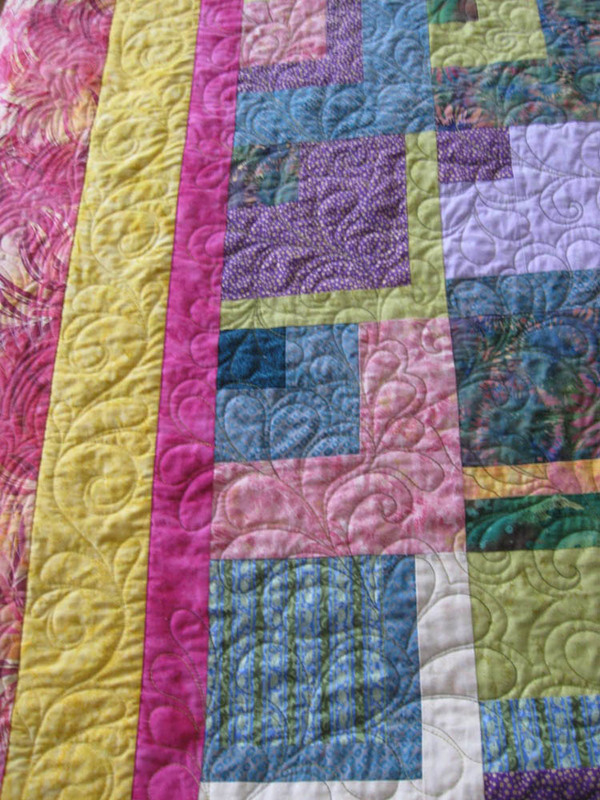 Quilt center (left), yellow border (center) and outside border (right). Completed quilt. 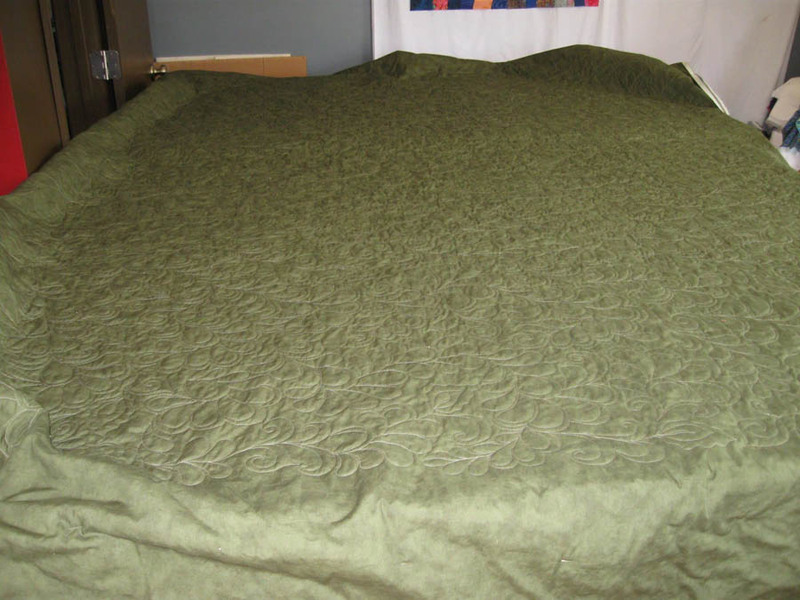 Finished quilted size: 103" x 116"
So, here it is, ready for delivery to the customer. Quilting a quilt like this takes lots of room and table area for basting and an adequate surface area around your sewing machine to support the quilt while quilting. I use bed risers to elevate my basting tables and the card table next to my sewing cabinet. This will minimize bending over and your back will thank you. It takes patience to quilt a piece this size. It is somewhat unwieldy in the early stages of the quilting, especially when moving the quilt sandwich from the basting tables to your machine. 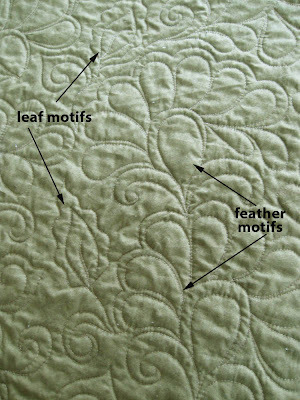 Once large portions of the center are quilted, it becomes more manageable. It also requires some muscle. A quilt this size is heavy and gets heavier as it is quilted. 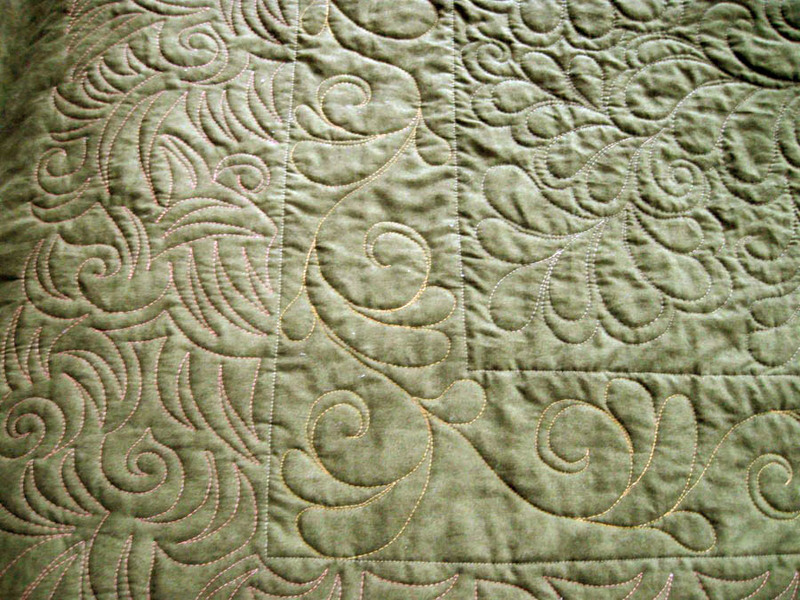 When you have some machine quilting experience under your belt. You can work your way up to quilting larger size quilts. It can be done. Comments? Questions? Wow!! 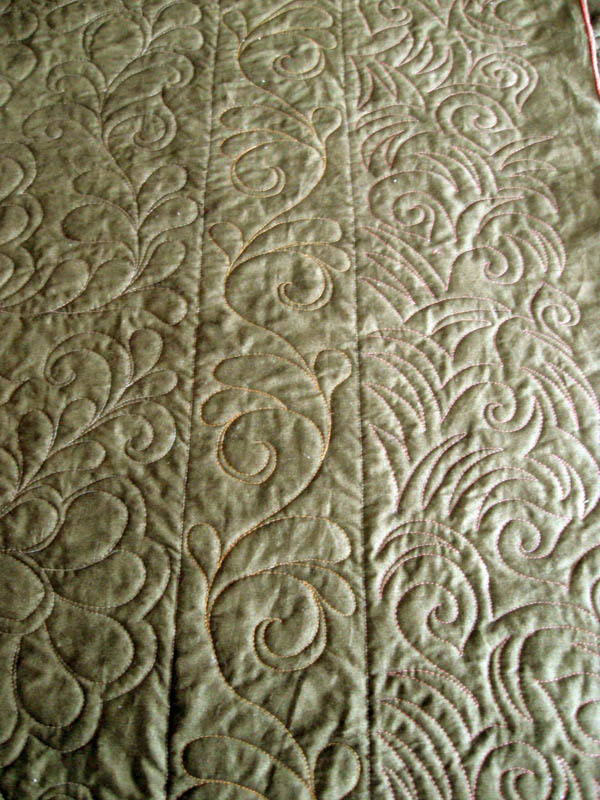 I quilted a queen size project for myself a few years ago on a Janome. Fortunately I was able to do it at the community center I visit every week and was able to use the tables available there. When I look at that quilt I sleep under, I am amazed at how this feat was accomplished and love it even more. Your quilt is beautiful!! Aahh, so you are also a Janome Girl. My machine is a real work horse. Thanks for the compliment on the quilt. I love the fabrics and colors she chose. WOW!! You continue to amaze me! This is simply beautiful. I know she will be pleased with it!